Help someone change their life's by sharing this! What makes the FUE better than all other hair restoration techniques? 1. One-third of US price! *Unlimited grafts summer 2018 promotion. Subject to donor hair availability and medical evaluation. Our service is our biggest asset, listen to real patients who have trusted us with this life changing decision, their experiences and testimonials are a testament to our success. Age 43, from San Diego, CA. Age 35, from Anaheim, CA. Is the FUE Hair Transplant guaranteed to work? FUE hair transplant technique is the most efficient technique for male pattern baldness and has shown over 85% efficiency with our current patients. Further more, the US National Library of Medicine National Institutes of Health has stated that the FUE hair transplant technique shows clear advantages over other hair transplant techniques and serve as an important alternative to traditional hair transplantation. What is the cost of FUE Hair transplant in Mexico? The average price in Mexico is between $3,500 usd to $5,900 usd with some exceptions for complexed hair types. Beware of clinics charging lower than $3,500 usd, remember if its to good to be true, there might be a bad reason and negative risk associated with this. The current price for an FUE Hair Transplant at our clinic is $4,800 usd and we are the only BBB accredited hair-loss clinic in Mexico, see details here. How fast does the transplanted hair grow after FUE Hair Transplant? Noticeable results can be seen after 4-6 weeks. The full benefit is obtained on average of 8-10 months. Remember, this varies for each patient as its associated with each persons normal hair growth speed. Upload your pictures to receive a FREE FUE Hair Transplant evaluation. TJ Hair Clinic understands hair makes all the difference and we want to help you with this life changing process. Book your FUE hair transplant today! US National Library of Medicine National Institutes of Health says the FUE technique holds clear advantages over other techniques including, Minimal post-operative recovery time, Microscopic scars in donor area are almost invisible, o need to visit surgeon again for stitch removal amongst others. 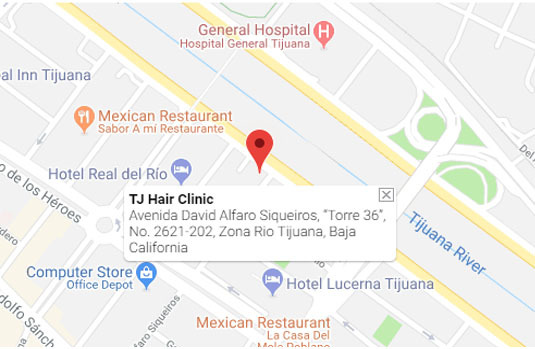 What makes the TJ hair Clinic the best choice from all the options in Mexico? Scott Musinki is a US Gynecologist who entrusted us with his hair-loss needs. 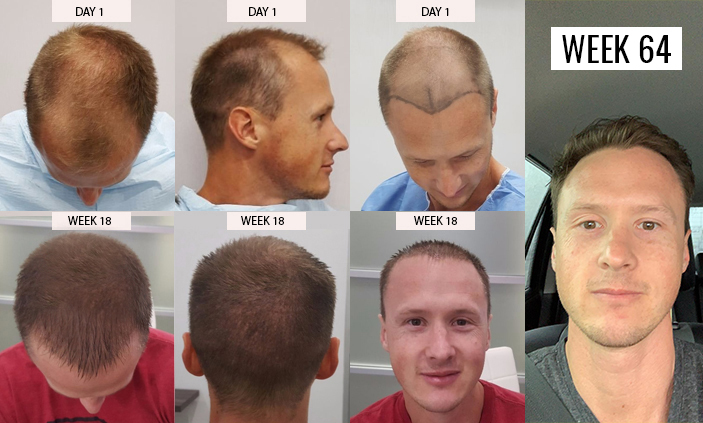 Scott attended a conference in the US and after seeing the results he decided to research for the best option for his hair-loss needs and found us to be the best option. Chris Robley like many international patients was initially unsure about traveling to Tijuana but knew the cost of the same treatment done in the US was 5 times more and decided to give us the opportunity. Chris is now a regular patient and friend of ours who is extremely happy with this results and experience. How short do I need to cut my hair? Using the 1.0 to 0.5 razor blade. But please make sure you don’t go completely bald and some hair is available otherwise if you shave it all off, we won’t be able to extract the follicles for transplanting. Can I have the transplant if I’m sick or have other medical issues? Please make sure you are prepared to let the medical team and nurses know of any type of medical issue or medical history so that they can assess your condition for the transplant and not risk your health. Let them know if you have or had STDs or Hep C, Bipolar or any degenerative diseases as these can impact the procedure and your health. How can I wash my hair after the transplant? The first 15 days will be with atomizer bottle by spraying water and letting it dry naturally to avoid touching and damaging the transplanted site. We will provide detailed instructions upon discharge. Do I need to cut my hair short for the transplant? Yes, this is a requirement t not optional, if you don’t cut your hair short yourself, we will have to do it for you the day of the procedure because it needs to be short to be able to extract the follicles for transplanting them, otherwise the transplant is not possible sorry. We need to have short hair at least as much as wanting to get transplanted, so if you don’t mind having irregular lengths of hair, you could potentially just cut the parts that will be used for donating. What is the cost of FUE Hair transplant at TJ Hair Clinic? The current price for an FUE Hair Transplant at our clinic is $4,300 usd all-inclusive*, see details here. Includes, free transportation, unlimited grafts based on donor area availability package, complementary treatment, follow-up program and more, a total value of at least $18,000 usd in the US. Do I need to take special medication after my transplant? Yes, we will prescribe anti-inflammatory and pain medication. We will provide the first prescription at discharge. Can I go back to my normal activities after my transplant? It depends on what are those activities, we recommended that you rest for the first 21 days without heavy lifting or hard physical activities, if not possible to at least 15 days after transplant.